"I think I am allergic to this"
"My lips feel so weird"
"Do my lips look weird? Because the feel weird?" "Why do I keep eating these?" One might suggest that I just stop eating them but how can people live with out eating apples? An apple a day keeps the doctor away and doctors cause me to hyperventilate! Apples are ALWAYS available and ALWAYS the cheapest option! They are so transportable; I can't switch to bananas because they will become crushed in my bag AND they don't sell BANANA GUARDS in Hungary!! 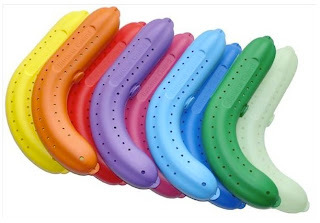 *Remember "Highly curved bananas can be straightened ever-so-slightly without harm to fit the Banana Guard shape. The opposite holds true of very straight bananas." I am not a doctor in any sense of the word, but I am closely related to one and have spent a significant number of hours near various sorts of doctors as they try to fix my old lady body. I know you aren't supposed to google your symptoms because it is guaranteed to cause anxiety because almost every single time you are diagnosed with pancreatic cancer or MS. However after the ongoing apple and pear incidents I broke down and googled it. I think I have Oral Allergy Syndrome. I think the hardest part of this is not laughing at the word oral. Basically they just went through the produce section and listed all the awesome fruits and vegetables. Sometimes I peel my fruit because they say it will help but usually I just deal with it. I am NOT giving up apples for this garbage. Hi, Jill. I have the same problem with eating these 2 fruits. (Hmmm...so you have a Smid nose and a Piebiak allergy!!) Peeling them before eating only prevents the stomach distress, but not the lip problem. A piece of advice -- unless you are eating a potato a day, don't shirk on eating bananas as your potassium level will dip too low and that is NOT good(again speaking from experience).